Kap-su Kim. Jung-ah Yum. Su-jeong Lim. Geun-yeong Mun. Thriller. Art House. Asian New Wave. Madness and Mental Illness. Horror. Drama. 01 Nigel's Choice. 01 Becky's Bests. 01 Tara's Midnight Movies. Mythology. Recommended. 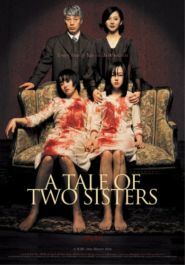 Two sisters, Su-mi and Su-yeon, return from a stay in a psychiatric hospital to the home they share with their father and wicked stepmother. Disturbing and inexplicable events soon begin to occur, strange noises, hallucinations, disembodied footsteps on the stairs all combine to stretch tensions within this already volatile family unit to breaking point. Are these phenomena a product of the sisters' disturbed minds, is it their stepmother cruelly tormenting them or could there be something more sinister afoot? You won't necessarily have the answers to all your questions at the end of this film but that doesn't really seem to be the point. 'A Tale of Two Sisters' is a beautifully crafted slice of horror based on a traditional Korean folktale that relies on a subtle Lynchian atmosphere and compelling performances to freak out its audience. At a time when the Far East is churning out Ringu (The Ring) derivitives at an astounding rate, this celluloid gem stands out as something a little bit special.